Wonderful summer or winter. Slopeside/TRUE SKI-IN/SKI-OUT.Visit www.whistlerluxury.com for more info. Our spacious luxury corner suite in Woodrun Lodge features the ultimate in location and amenities for a fantastic vacation! Perfect location viewing the slope/lifts - relaxing and quiet, yet close to everything. Rates are as posted. 4 night minimum stay except for posted specials. Woodrun 410 is a spacious, 1540-sq-ft corner condominium with many ceiling-to-floor windows and plenty of light, boasting fabulous views of the mountain and Cruiser Run on one side, and the woods and ski-in trail on the other. Spacious, TOTALLY REMODELED AND PROFESSIONALLY DECORATED, this is the perfect vacation home, in the ideal location with room for everyone to relax. The decor is a wine lover's delight! Plus Gourmet Kitchen with Granite Counters and Stainless Appliances. Our superb true ski-in/ski-out, slope-side location with heated sidewalk directly to the slope provides quick access to all the ski areas on both Whistler and Blackcomb mountains. You can relax on one of our two full-size sofas or the comfortable over-sized chair and ottoman, and enjoy the fireplace as you view the slopes and watch for your family or friends to return after a day of skiing. Our dining table comfortably seats 8 people! Our two balconies offer a perfect location to enjoy hot chocolate or a nice glass of wine at the end of the day. Wrap up in one of our plush robes after a swim in our heated pool, or perhaps enjoy our huge HOT TUB! Master Bedroom - stately master suite - king-size bed with a luxurious, over-sized, pillow-top mattress. Sliding glass door leads to a tiled balcony with view of slopes, pool, and hot tub. TV/DVD. Safe to secure your valuables. Master bathroom is generously proportioned and has a heated tile floor, and soaking tub with shower. Bay Window Bedroom - comfortable queen-size bed and large bay window viewing slopes, pool, and hot tub. TV/DVD, dresser, and large closet. Woodland Bedroom - double-size/single-size bunk beds and small dresser. Sliding glass door opens to private tiled balcony viewing the woods and trail. 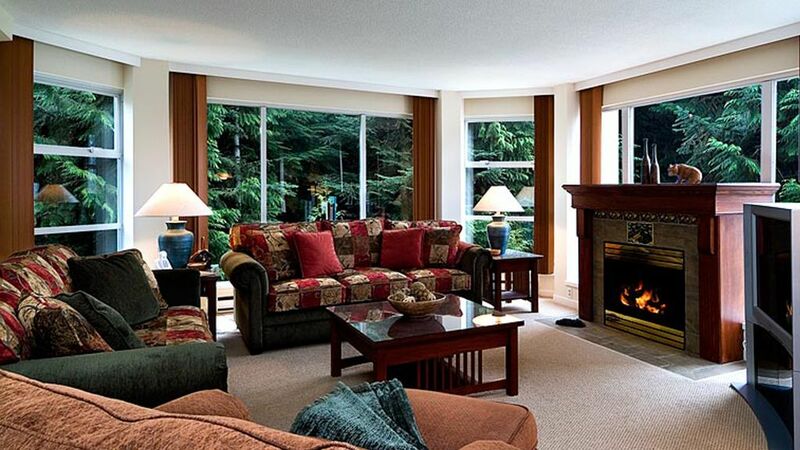 Woodrun Lodge is slopeside near the Fairmont Chateau Whistler and Four Seasons, close to many shops and restaurants. It is just a short, lovely walk to Whistler Village, or you may choose to use the FREE village shuttle which stops in front of Woodrun Lodge. Jack is a dentist, Patti is a pharmacist who markets compounding and functional medicine, Andrew has a Ph.D. candidate in Analytical Chemistry and works in private industry, Mike is a Pharm.D./MS and works at Nationwide Children's Hospital in Columbus OH, and John works at Morgan Stanley in NYC. We LOVE Whistler - every season offers something special for everyone who visits. Space to relax, great views, close to all the action, but quiet and cozy. Two full sofas and overstuffed chair with 50" HD TV. TRUE SKI IN/SKI OUT - on the slope of Blackcomb Mountain, an easy walk to the base. Our group of ladies were very impressed by the size and layout of this condo. There were a couple minor things (like the ski lockers were a little tight for all of our snowboards) but we figured it out. Reception was more than accommodating with every interaction. And you just can't beat ski in/ski out. We had an awesome experience in Whistler and staying in 410 was a huge part of it. We are a family of 6 adults. We stayed at 410 Woodrun in February 2019 and it was superb. Very comfortable lounge/dining area, well equipped kitchen, with lots of space to relax after a day skiing. Ski straight down to the new Backcomb Gondola or Magic chair, and ski straight back in to the property. The concierge, Shirley, was very informative and provided us with any information we requested. The owner, Patti, was also very prompt at coming back to us and the booking was straightforward. Free shuttle bus which runs regularly into Whistler is very handy if you don't fancy the lovely walk into town. Would highly recommend this property and we hope to return. This is a great ski in/out condo! The unit was very spacious and well appointed. Would highly recommend! Thank you so much for taking the time to send your kind words. We hope you will visit again soon! Perfect for our family event. Everything was provided that we needed and the location is ideal. Nice bright interior living space. Thanks so much. We are so happy you were able to enjoy our "home away from home"! We really enjoyed staying at this beautiful condo and were so surprised that the pool was so warm to swim in when it was a little chilly outside. We used the hot tub every night then enjoyed pop corn and a movie in front of a cozy fire. The walk into the lower village was too much for one traveler who recently had some health challenges but I either drove to the village or she took the shuttle while the others walked down. Loved the covered bridge over Fitzsimmons Creek Bridge on the walk to the lower village. What a great place for a picnic or relaxation. Be sure to take a camera to a great photo op there! The view of the trees from the living room are wonderful. Would love to return again. We had a super service from the concierge Shirley..the ski lift tickets were at the appartement on arrival and she was easily reachable by phone ..
Rates are in USD. No hidden fees. We include cleaning and checkin fees. Holiday payments are due 6 months in advance.